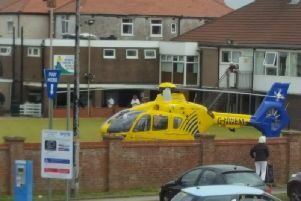 A man has been hit by a tram in Cleveleys town centre. The man, believed to be in his 20s, was hit by a tram at around 5.30pm on Sunday, January 20, in Victoria Road West. Two separate incidents brought the tram network in Cleveleys to a stop on Sunday, January 20. Pic - Kelly Berry. A passenger on the tram, May Cooper, said: "I was on the tram and there was a big bang. The conductor phoned the police and an ambulance, because someone had been knocked down. It was near the British Heart Foundation charity shop crossing." The man is understood to have suffered minor injuries. Later the same evening, at around 10.15pm, the tram network was forced to stop again after a car became stuck on the northbound tracks in Cleveleys town centre. A spokesman for Blackpool Transport said: "Trams are terminating at Little Bispham North Bound at Rosal Beach South bound due to a car on the track at Cleveleys. There will be delays to services while we retime the trams."